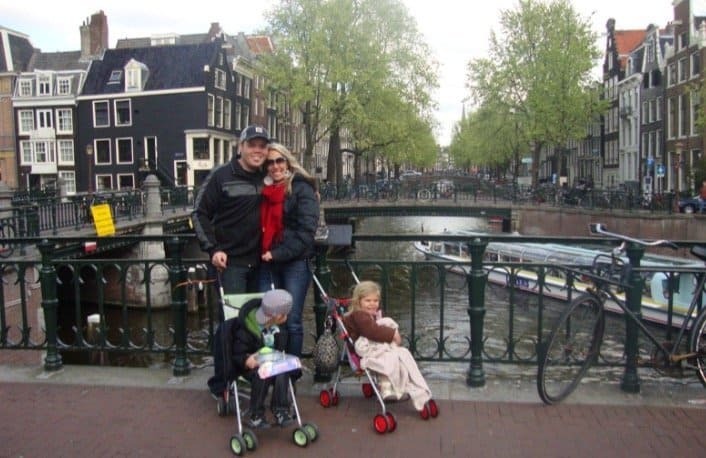 A few years ago my husband and I were very brave souls and took our three and five-year-old kids to Europe for a family trip. It wasn’t the trip and time change that worried us, but rather the long flight that made us scared. A lot of the time we just road trip to avoid all the hassle, but this time a flight was necessary. So, we knew we needed to think and get as much stuff as possible beforehand because let’s face it: a bag of pretzels or peanuts wasn’t going to get them through eight hours of traveling. 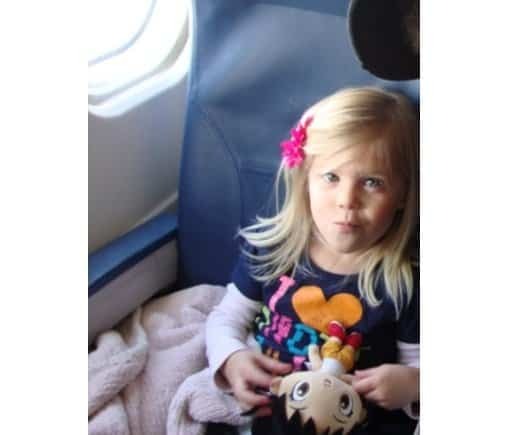 So, here is my list of what we did to travel with our little ones on a flight. 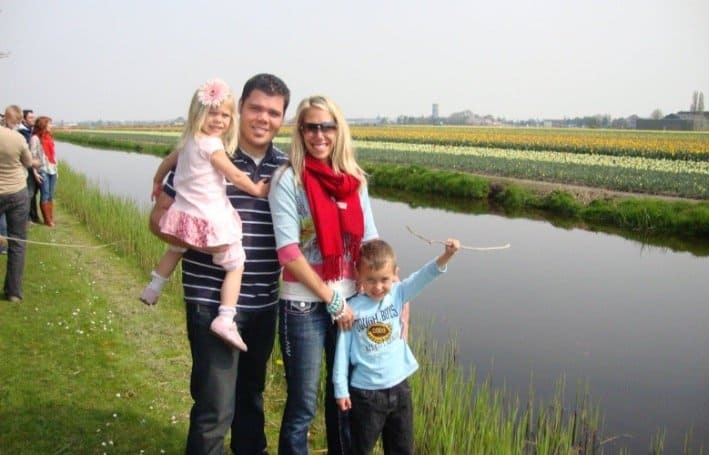 Taking a plane trip is like getting your kids to cooperate for a family picture but for a lot longer! Pack dollar store items and wrap them like a gift for your toddler. It makes it kinda fun for them, and it can be a toy/activity book they’ve never seen before. Let them open some of them when they get on the plane. Have a few more that are wrapped and you can use it for motivation for them to be good. The excitement of opening a gift is fun for them. Places I like to go include dollar spot at Target, Walmart, or even Walgreens which has quite a few fun and cheap kids’ toys. I love Crayola Wonder coloring books. They are clean and take up a lot of time. Toys R Us has a fun snack and play travel tray. 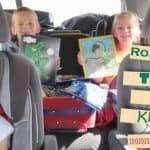 You can also make a fun busy kit book like shown in these road trip tips for kids. 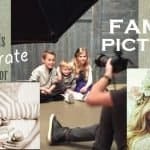 Bring the things that they normally enjoy the most at a home and bring a lot of them! Maybe it’s video games, LeapFrog, Pokemon, football cards, minion cards, Shopkins, Game boy, I-pod, movies on an Ipad, coloring books, or even a sticker book from Costco. Also, bring their favorite shows to watch. For my little girl, this is Barbie Mariposa. I think I still have some of the lines from that movie memorized. But she loved it. My little one now is all about Paw Patrol and Mickey Mouse. Whatever they love to do and play with, don’t forget to bring chargers and make sure it’s all ready to go before the trip! Bring their favorite compact blanket. They’re easy to pack, roll up in a ball, and use as a pillow. This is the most important item on this list. Bring a duffle bag just for treats and snacks. When you think you’ve brought enough, bring more!! I promise this saved us. It will save you once on a long flight and then again while waiting for the bags, car rental, and all the little stops that require patience for the little ones. It’s also super handy for when they wake up early in the hotel and are really hungry, and either nothing is open yet or it’s simply not convenient to get anything for them. It was the best thing we brought. Bring all the little snack packs, crackers, granola bars, fruit snacks, cookies, goldfish crackers, pretzels, and whatever they love. Bring back the simple games on the plane, like “I spy.” My kids love that game and they get into it. It’s free and easy and can come in handy when you’re tired too. Also, the alphabet game they have to look around for all the letters from A-Z. It can keep them busy. Sometimes flying can hurt the little one’s ears. Bring binkies if they’re little or gum if they’re old enough to chew it. Little dumdum suckers also work great for takeoff and landing. Kid’s Health also says that if you know that their ears are going to hurt, it’s a good idea to give them ibuprofen or acetaminophen 30 minutes before the flight. If your child has an ear infection, increased pain might occur. So, delaying your flight or understanding that pain beforehand is key. Another little trick if your little one is sensitive is take two of the plane cups from your drinks and cover both ears while landing. It actually helps and is worth the try if that worries you at all. Good luck!! We are actually going to Hawaii this summer and our little one will be almost three, so I will be doing all these tricks again. I will be for sure packing my duffle bag of snacks and some Mickey Mouse Clubhouse and Paw Patrol!! Best of luck and happy travels!! !